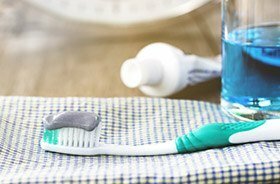 At Torrington Dental Care, we are always happy to provide our patients with tips on how to brush more effectively at home. Diligent oral hygiene is an essential part of lifelong oral health, and doing it consistently can really help you save on your dental care as the years go by! In our experience, there are always one or two things even veteran brushers can improve, helping them take even better care of their teeth between appointments. Why Choose Torrington Dental Care for Help with Tooth Brushing? Brush your teeth at least twice every day. The most important time to brush is right before going to bed. Use a soft bristled toothbrush and toothpaste that have both been approved by the ADA. Start by angling the toothbrush at 45 degrees against the gums. Move the bristles in small, circular patterns. Make sure you’re feeling the bristles on your gum tissue – that means you’re doing it right. Clean every surface of the teeth, including the front sides, the inner sides, and the biting surfaces. To clean the inside of the front teeth, you can use the tip of the brush for maximum effectiveness. Remember to brush your tongue! This will eliminate harmful bacteria and improve your breath. If you struggle to brush effectively, an electric toothbrush may be a wise investment. They are very simple to use. All you must do is place the bristles of the brush against the teeth and gums and then let the motor do all the work. It will be able to clean several teeth all at once.